Brooks saddles are usually the saddle of choice when finishing a vintage bike rebuild. You may buy a new Brooks traditional saddle or simply hunt around for an old Brooks saddle to compliment the build. 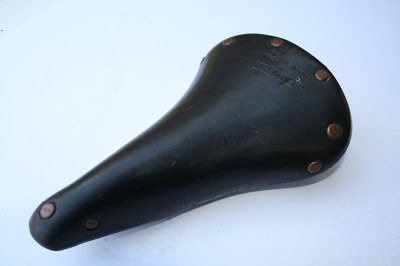 I've always known about French built "Ideale" brand saddles but I've never owned one until recently. I've done a little research and discovered that Ideale saddles from France have a history as deep and as rich as Brooks saddles from England. At the height of cycling in the 1950's and 1960's both brands were equally well respected throughout Europe. Each brand had a wide variety of racing and touring saddles and the brands were very competitive, as indeed the French and English have always been. 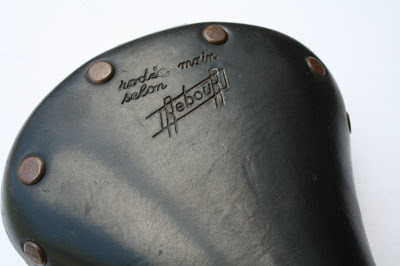 After a bit of research I decided to track down an Ideale #92 Diagonale saddle, the model that has the words "rodee main selon Rebour" stamped into the leather on the top of the saddle. I am unsure of the French translation of this phrase, although the word "Rebour" relates to Daniel Rebour who was a French illustrator of the post war era. During the 1940's, 50's and 60's Rebour created precise line drawings for catalogues and magazines documenting the innovations, intricacies and curiosities of bicycles and their components. His exquisitely detailed and beautifully crafted illustrations showed a love for the bicycle and its mechanical beauty. "rodee main selon Rebour" stamped into the leather. I was after an older model saddle and managed to score a near new #92 Rebour saddle pictured above. At a guess I would say that it was manufactured during the mid 1970's as this one has small copper rivets with the word IDEALE stamped into the top of each rivet. This is a beautiful saddle. The leather is very clean and supple and is held together with chromed steel framework and rails. The nose of the saddle is particularly nice, it has a chromed steel nose with the words and letters "IDEALE TB BTE S.G.D.G" stamped into the surface. The nose of the saddle. Apart from leather bicycle saddles, I also have a strong affinity with Masi brand bicycles. 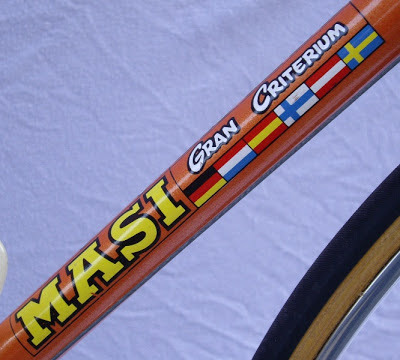 I won't go into the history of Masi bicycles, but I will say that the brand played an important role in the history of cycling throughout Europe in the 1950's. They still manufacture Masi bicycles today (now a U.S brand), but most importantly.....they still pride themselves on producing stylish steel framed bicycles of excellent quality. Masi bicycles - perfection in steel. The blend of old and new. The blend of old and new is fantastic. The steel bike rode beautifully anyway, but the addition of a classic French leather saddle has improved the riding experience. I've had the saddle on the bike now for about 1000 kms or so and I am really pleased with it. Although it is not a lightweight saddle it is a very stylish and comfortable addition to the bike.